These are by far the most flavorful turkey burgers I’ve ever tasted. The mixture of warm roasted spices, fresh herbs, feta, and olives set these so far apart from the average grilled meat patty that I almost hesitate to call them burgers. I didn’t even bother with a bun – the crisp cool lettuce wrap served as a perfect balance to the warm spiced turkey burger. I first made these burgers a couple years ago after reading about them on Kalyn’s Kitchen. My cousin Corinne was visiting and we grilled the burgers and ate them stuffed into pita. I followed Kalyn’s variation on the original Fine Cooking recipe but added a twist of my own by adding crumbled feta into the turkey mixture. They were so delicious that Corinne still talks about them to this day. When I noticed a package of ground turkey in the fridge, I decided it was time to revisit these delicious burgers. This time, I made a few more changes. 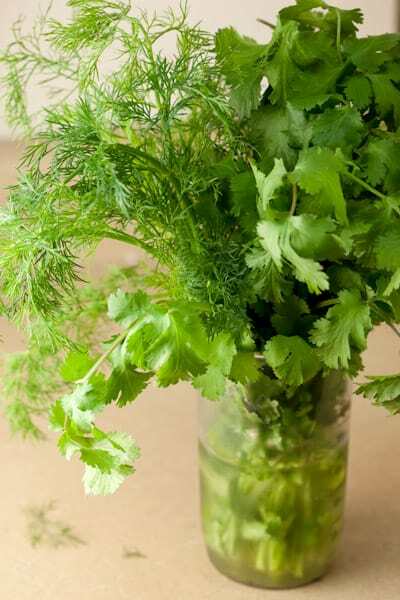 The original recipe calls for fresh mint and parsley, but when I looked in the fridge, the only herbs I had on hand were dill and cilantro. It seemed like a perfectly good substitution to me. 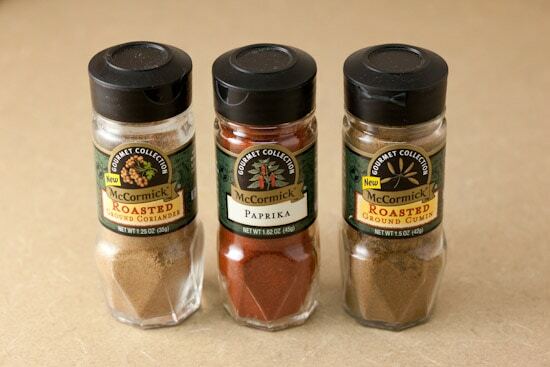 Next, I started looking through my enormous collection of spices and realized I could use some of my favorite McCormick Gourmet Roasted spices. If you haven’t yet tried the Roasted Cumin and Roasted Coriander, you’re in for a treat. I also figured I couldn’t go wrong adding a handful of chopped olives along with the feta this time around. Now that I’m done fiddling with the recipe, it’s time to start making the burgers. 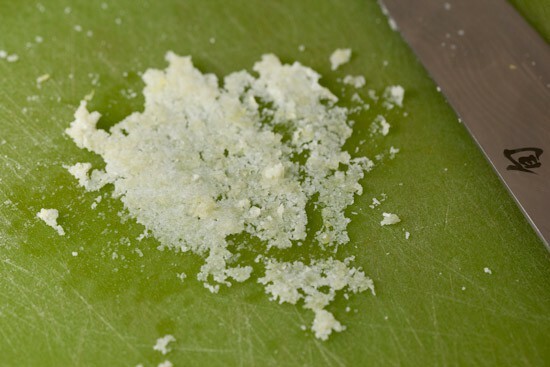 The first step is to make a garlic-salt paste. It might seem fussy to ask you to do this, but it’s really simple to do and I really think that it helps to spread garlic flavor evenly throughout the burger. I find myself using this paste a lot in my cooking, so I’m hoping you’ll find it to be a useful tip. I like to start by smashing the peeled cloves against the cutting board with the side of my chef’s knife. Then I sprinkle kosher salt over the garlic and mince it all together with the knife. 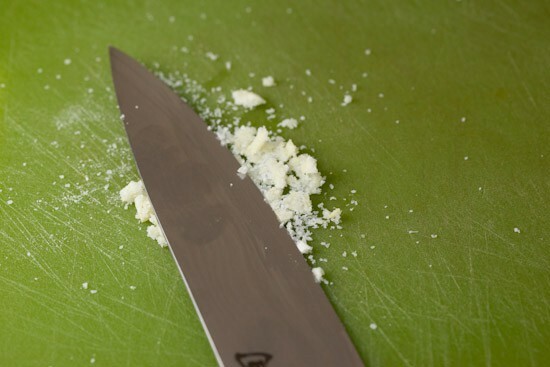 Next, use the side of the knife to smash and smear the mixture together against the board. Do this a couple of times, mince it some more, then repeat the smearing motion. You should noticed that it starts to form a uniform paste. Just keep mashing, smearing, and chopping until the pieces of garlic are no longer visible and it’s turned into a paste. You’ll end up with something like this. 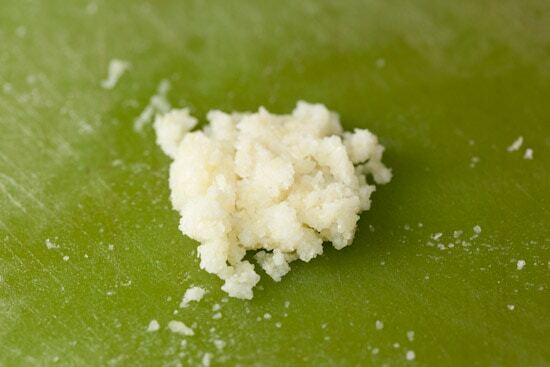 Hint: a little bit of this garlic paste is great for whisking into salad dressings. 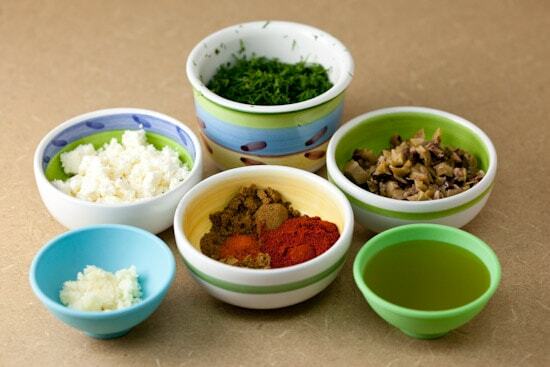 Now measure out all of your ingredients: chopped herbs, chopped olives, crumbled feta, olive oil, and garlic paste. 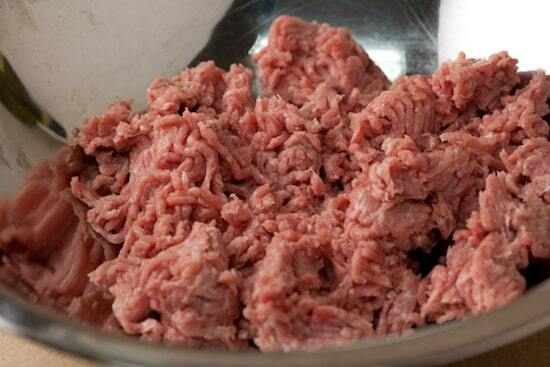 Break the ground turkey into big chunks in a large mixing bowl. Sprinkle all of the ingredients evenly over the meat and mix gently with your (clean) hands. You want everything to be evenly distributed throughout the meat, but try not to over mix. Divide the turkey mixture into six equal pieces and form them into patties. Arrange the burgers on a sheet pan or platter and put it in the refrigerator while you prepare your grill. This can be done a few hours in advance. Grill the patties, covered, over direct medium heat for about 4 – 6 minutes per side or until just cooked through. 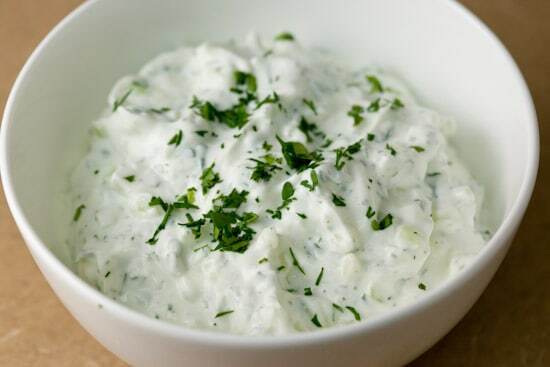 I serve mine with homemade tzatziki. This batch was made with FAGE Total Greek Yogurt and it was delicious! Here’s the recipe. As I mentioned earlier, I chose to eat the burgers in a lettuce wrap this time and I thought it was a great choice, but these burgers are also delicious wrapped in pita. You could always go the traditional bun route as well. I have been chosen by McCormick to participate in the McCormick Real Gourmets program. I have been paid by them and I received a big box full of McCormick Gourmet spices. I have been using McCormick Gourmet for years, and am thrilled for the opportunity to explore more of their spices and blends. I used McCormick Gourmet Roasted Ground Cumin, Roasted Ground Coriander, and Paprika in this turkey burger recipe. Make a paste with the garlic and kosher salt: On a cutting board, sprinkle smashed and peeled garlic cloves with the salt. 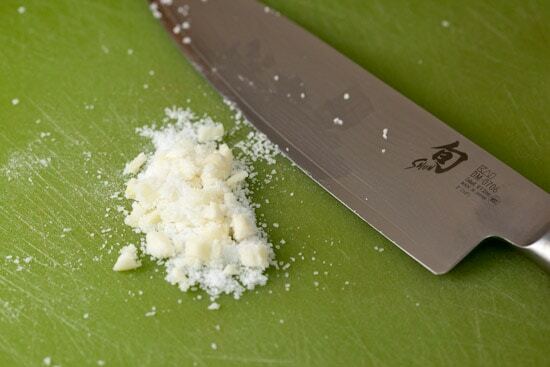 Mince the garlic and salt together then smear and mash to a paste using the flat side of a chef’s knife. Alternatively, you can mash the garlic and salt to a paste using a mortar and pestle. If neither of those methods work for you, just press or chop the garlic finely and stir together with the salt. 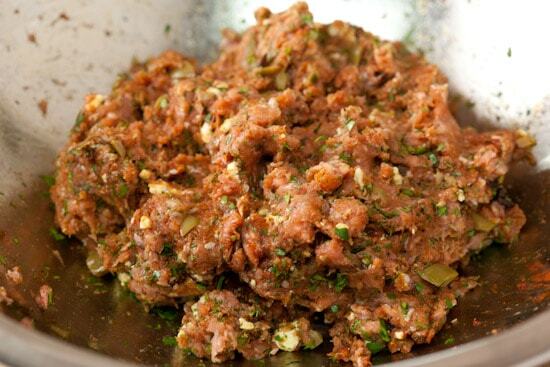 Gently break the ground turkey into pieces in a large bowl then mix the garlic paste, cilantro, dill, olive oil, paprika, cumin, coriander, cayenne, feta, and olives into the ground turkey (it’s easiest to use your hands for this). 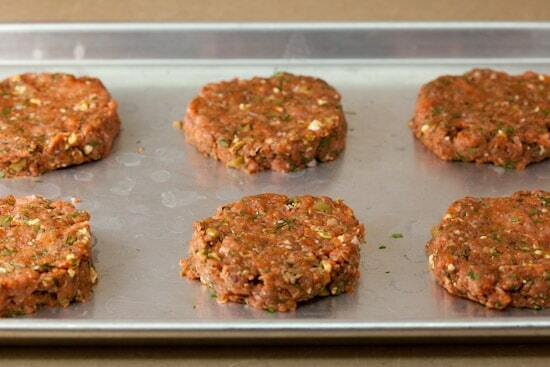 Shape the meat into 6 equal 1-inch-thick patties. Refrigerate, uncovered, for at least 20 minutes and up to 4 hours. While the burgers are chilling, prepare a charcoal or gas grill. Grill the burgers, covered with vents open, over direct medium heat until nicely marked and just cooked through (an instant-read thermometer inserted in a burger should read 165°F), about 4 to 6 minutes per side. 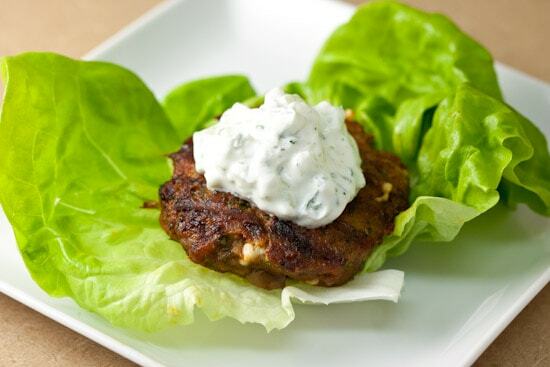 Top burgers with Tzatziki and serve wrapped in lettuce or your favorite flatbread. these look so much better than the turkey burger I had for lunch from a food court ;) Love the addition of olives. As far as the garlic goes, I usually just use a microplane. Great flavors! Perfect for spring and summer too! Yum! They soubd wonderful. 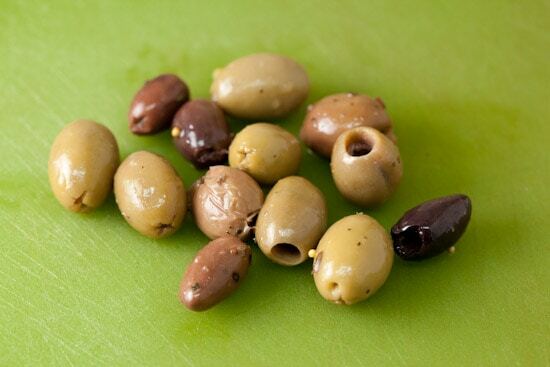 I am crazy about olives. These sound awesome. I'm having it for dinner tomorrow night. Nicole, I'd never guess these were turkey burgers...they look awesome! Love your garlic tip! I make something similar but I love your addition of olives and spices! I love your version of the turkey burgers, yum! Wish I could pop over for dinner and try them. 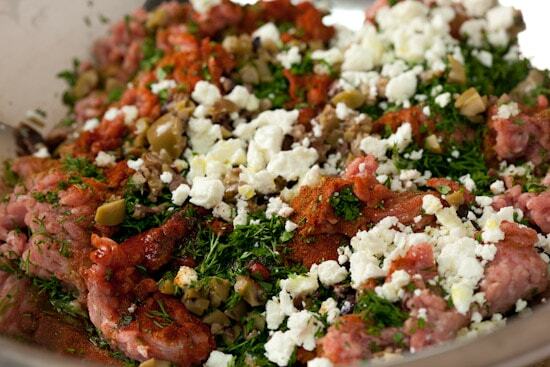 Turkey seems to lend itself to Mediterranean flavors. Yours look great! They do sound flavouful and delicious and sans bun tney are very carb friendly!! First of all: I am thrilled that they have roasted spices. I didn't even know they existed. And the Turkey burgers look fantastic. I can't wait to try this version. These are putting a big fat smile on my face. I love turkey burgers but have gotten kindof bored with them lately. I usually just add some spices and chopped spinach. I love your additions! These pictures are terrific. So vivd and clear. 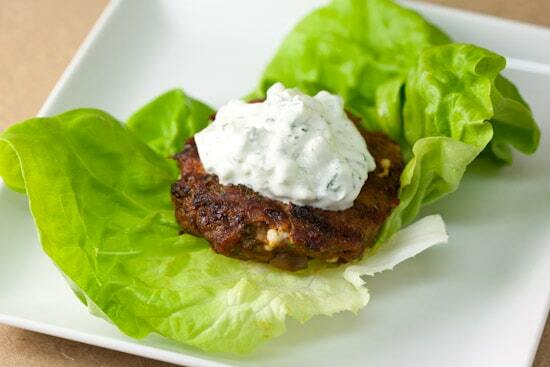 Great twist on turkey burgers! 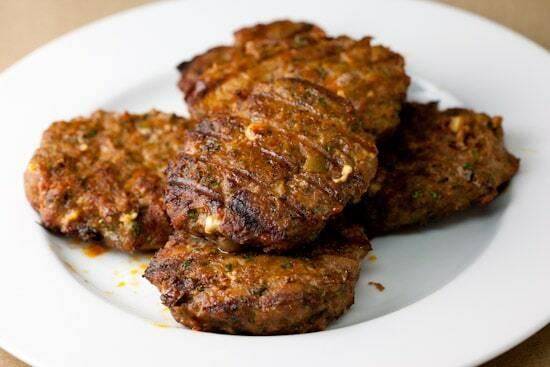 I love the recipes from Fine Cooking and this recipe gives a nice mid-eastern touch to the burgers. I make turkey burgers just like this- for those who don't have a grill, I bake mine at 400 F in the oven on top of a cookie drying rack. Beautiful photography! I can't wait to try these! I have pretty much switched from ground beef to turkey for everything in my life!! This sounds amazing! This looked so good, I put the ingredients on my shopping list for today. My husband is currently grilling the patties up & I can't wait to eat them! Thanks for the recipe. I think that I have found the perfect turkey burger. I am giving these a try along with this great sauce that I have made before! These look great! All my favs in one....can't wait to make these! Thanks! This recipe was excellent! Tried it today when we grilled burgers and veggies for dinner. No alterations...perfect as is! I am so burned out on my current turkey burger recipe. Thanks for this. It looks so yummy and light. I like to serve my turkey burgers on a salad. Lots of crunch. Btw, how do you keep your turkey burgers from sticking on the grill? I always have trouble with that. These were AMAZING!! I made them last night and it was a HUGE hit with my family! Thank you and keep on throwing out these great recipe ideas!!! I made these last night and they were fantastic. Thanks! Incredible flavours!! I added mint to my patties as I didn't have dill and loved it. Perfect for backyard grilling. Thanks for the recipe! This were FABULOUS! I am actually going to feature them on my blog (www.mimisfitfoods.com) tomorrow. I'll be listing all the nutritional information too. I seriously loved, Loved, LOVED these! Thanks for sharing! wow! love this recipe. I must ask my mom to make Turkey burger for me. Thanks for sharing this amazing and delicious recipe. Your version of spiced turkey burger seems very healthful. Thank you for sharing.